1. In a large pot heat one cup of Ghee. 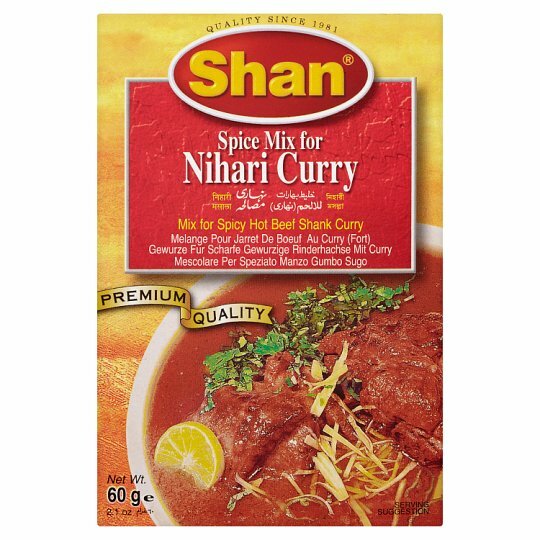 Add garlic stir and add meat, bones and Shan Nihari Curry Mix. Fry for few minutes and add 10 glasses of water. 2. Cover and cook on very low heat until the meat is tender. (for beef 6-8 hours, mutton 4-6 hours). 3. Dissolve flour in 3 cups of water and add this gradually into the gravy. Stir to mix evenly with the gravy. Remove the bones and cook for 15 minutes on high heat. 4. Make the remaining 1/2 cup of ghee hot and add the sliced onion. Fry until golden and stir into the Nihari. Cover and simmer for 30 minutes on a low heat. Garnish with finely chopped green chillies, ginger and lime juice. Serve hot with naans.